« End of Juneathon NOT a TOTAL fail ! 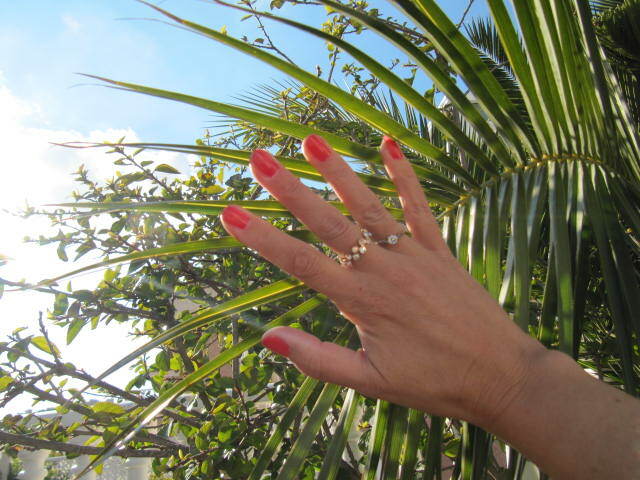 Summer’s here and I have screwed up! Some time ago I booked to have a facial peel. Not the full laser scorch your skin off version, but a milder chemical one. I had it done 2 weeks ago and since then have had to stay right out of the sun. This didn’t seem like it was going to be a problem when I first booked it as Summer did not look like it was going to happen, and so you can all thank me that the day I had my face done Summer arrived with a bang! Ironically, the whole reason that I had to have this peel is due to the Sun in the first place and so I want everyone, especially younger readers to take note of this because it is important. 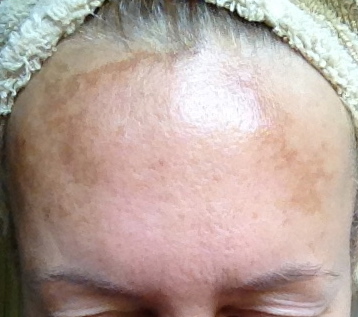 I have unsightly brown marks on my forehead and cheeks which have been caused by the sun. Not from sunburn as I’ve never burnt, but from general sunbathing. The condition is called Melasma, and I did it in my teens and twenties when I used to lie in the sun all day with NO sun-protection. As I said, I never burnt, I used to be the envy of all as I went beautifully brown with no worries. 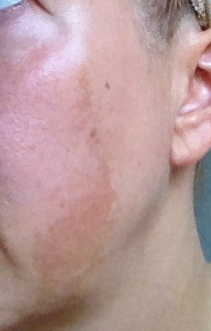 The worries began when I was about 35 when the brown marks first started to appear. It’s a time-bomb. You do not have any idea that you’ve done it at the time the damage is caused. It shows up later in life and does not go away. It gets worse. Mine started with a freckle on my forehead that began to spread. Now it’s all over my forehead, and down the sides of each cheek, and it’s still developing now around my mouth. I’ve worn factor 30 to factor 50 on my face for the past 15 years but the damage was done long ago and it is still manifesting itself. This peel is only the latest thing I’ve tried to get rid of it. Nothing has worked previously and I’ve spent over £1000 before now. There currently is NO guaranteed remedy. This latest attempt has cost me £400 and I may have to have it repeated 2 or 3 times with no guarantee that it will clear the marks. 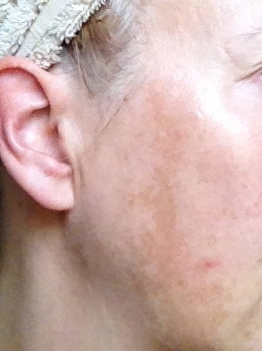 So far I can’t really see a difference, but it’s a 4 week programme of aftercare with fade cream, so we’ll see. ALWAYS WEAR FACTOR 50 ON YOUR FACE WHATEVER AGE YOU ARE AND WHETHER YOU TAN OR BURN. There are many brands these days that offer lotions especially for the face/neck/chest area which you can use under make-up in place of your normal moisturiser, or just on their own at the beach. Another thing to remember is that sun lotion like many other cosmetics has a use by period. To know what it is, look on the labelling, and you will see an emblem of a little round pot with the lid off. It will have a figure in it for example, 12M, or 24M, this gives the number of months that the product still works after it has been opened. If you are like me you’ll have no idea of when you opened it, so its always worth making a note in your diary, on your phone or somewhere else that you’ll remember, of the name of the product and the date that you first used it. Particularly for sun lotion as often we take a bottle over from one year to the next, and it might be OK after 12 months, but after that it could be absolutely useless. Watching a skin care expert on TV recently, he said that a normal sized bottle of sun lotion (always factor 30 or above) should last you one and a half days if you’re applying it correctly, i.e. a thick layer 3 times a day.